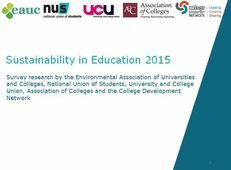 A report on sustainability in tertiary education has been released by the Environmental Association for Universities and Colleges (EAUC), National Union of Students (NUS), University and College Union (UCU), Association of Colleges (AoC) and the College Development Network. 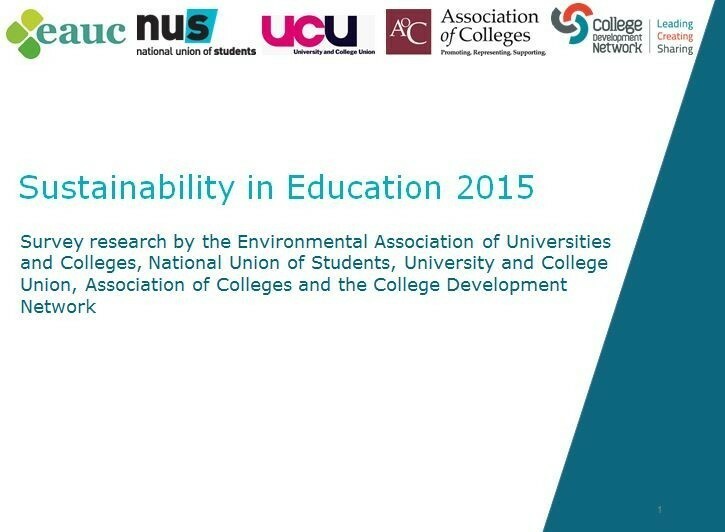 The report is based on survey responses from 548 staff involved in sustainability in universities and colleges. The survey set out to identify how further and higher education institutions are responding to environmental sustainability and social responsibility challenges, as well as how staff perceive their institution’s efforts. The intention is to rerun the survey annually, producing an annual report that tracks perceptions and trends across tertiary education. • A quarter of respondents overall report that sustainability is a strategic priority. • University staff indicate doubts regarding the likelihood of achieving carbon reduction targets at their institutions, with two fifths saying they are unlikely or very unlikely to meet targets. • Action on teaching and learning for sustainability is varied, with a quarter of Higher Education sustainability staff indicating that they do not have any plans, projects or campaigns in this area at their institution. • Just 16% of overall respondents rate performance on ethical investments as ‘very good’ or ‘good’. • A lack of financial and staff resources are seen as the biggest barriers to acting for sustainability with support from the highest levels seen as the most important way of overcoming these barriers. • There are concerns over reductions in budget for sustainability, with a third of college sustainability staff respondents and a fifth of university sustainability staff respondents expecting a decrease in budget.